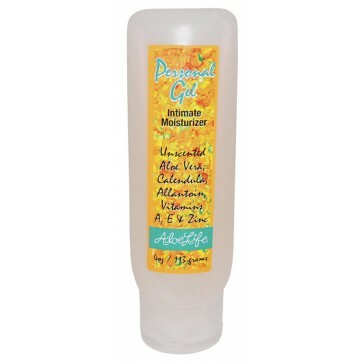 Personal Gel Intimate Moisturizer 4oz is a silky non staining formula that adds moisture and protection to dry sensitive skin naturally. A favorite of Active Men and Women for intimacy, menopausal women, moms (post child birth), etc. Try it you will love it! - 100% Satisfaction Guaranteed! Personal Gel Intimate Moisturizer 4oz is a silky non staining formula that adds moisture and protection to dry sensitive skin naturally. Its gentle ph is soothing to use on any dry skin area; lips, ears, nose, hands, heals and other cracked or chaffed skin. Safe to apply as needed. The Organic Aloe Vera, Calendula Extract, Allantoin, Vitamins A, E, and Zinc are very soothing and effective to burning and itching skin and do not contain strong scents or unnecessary manufacturing aids. Personal Gel is not a spermicide or contraceptive yet supports healthy moisture balance as needed. Safe if ingested. A favorite of Active Men and Women for intimacy, menopausal women, moms (post child birth), etc. Try it you will love it! - 100% Satisfaction Guaranteed!